Your doctor has selected Scorpio® because he/she feels it’s a good fit for you and your lifestyle, and because your doctor knows that over half a million Scorpio® knees have been used successfully worldwide during the past decade. The Scorpio NRG® Knee System was designed to provide greater stability than other knee replacements available today. 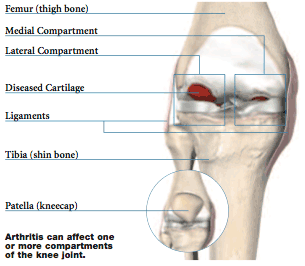 One of the most common causes of knee pain and loss of mobility is the wearing away of the joint’s cartilage lining. When this happens, the bones rub against each other, causing significant pain and swelling – a condition known as osteoarthritis. 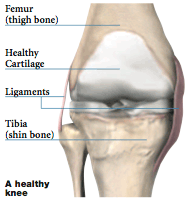 (Trauma or direct injury to the knee can also cause osteoarthritis.) Additionally, without cartilage there is no shock absorption between the bones in the joint, allowing stress to build up in the bones and contributing to pain. Knee replacement is a surgical procedure – performed in the US since the 1960s – in which a diseased or damaged joint is replaced with an artificial joint called a prosthesis. Made of metal alloys and high-grade plastics (to mimic the function of bone and cartilage, respectively), the prosthesis is designed to move just like a healthy human joint. Most people take their knees for granted. They understand that knees, like hinges, enable legs to bend for walking, running, climbing stairs and sitting, but they don’t usually think about the complex system of tendons, ligaments, muscles and bones that allow normal movement. They also don’t think about how the full weight of their body is transferred through the knee to allow them to walk smoothly, almost effortlessly at times. While traditional knee replacements rely on a mechanism that requires muscles to work harder, the single radius of the Scorpio NRG® knee helps enable a full range of movement faster.3 This design also allows for better quadricep function and less anterior knee pain after surgery.3 The potential for less pain and improved muscle function can translate into greater confidence with every step. In knee surgery, the knee is flexed and the leg suspended. One muscle is separated to expose the femur (thigh bone); later, the tibia (shin bone) is exposed. The damaged surfaces at the end of the thigh bone are trimmed to shape it to fit inside the total knee prosthesis. The shin bone is cut flat across the top and a hole is created in the center to hold the stem of the tibial component. If needed, the kneecap is trimmed and the patellar component attached. At various points during surgery, the alignment, function and stability of the knee joint are evaluated and required adjustments are made. The prosthesis components are cemented into place, any contracted ligaments are released, the mid-vastus muscle is reconstructed and the incision is closed. But as good as the results often are, knee replacement is major surgery, and as such, there are certain risks and expectations that must be recognized. As with any major surgical procedure, patients who undergo total joint replacement are at risk for certain complications, the vast majority of which can be successfully avoided or treated. 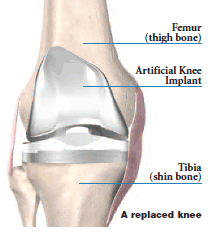 In fact, the complication rate following joint replacement surgery is very low. Serious complications, such as joint infection, occur in less than 2% of patients.4 (Other possible complications include blood clots and lung congestion, or pneumonia.) Talk to your doctor for a complete assessment of the potential risks. You don’t have to live with severe knee pain and the limitations it puts on your activities. If you haven’t experienced adequate relief with medication and other conservative treatments, joint replacement may provide the pain relief you long for and enable you to return to your favorite activities. The ultimate goal is for you to be as comfortable as possible with your treatment option – and that always means making the best decision based on your own individual needs. For more information visit www.aboutStryker.com. 2. American Academy of Orthopaedic Surgeons. 3. Mahoney, O.M., et al., “The Effect of Total Knee Arthroplasty Design on Extensor Mechanism Function,” JOA, Vol. 17, No. 4, 2002. 4. Hanssen, A.D., et al., “Evaluation and Treatment of Infection at the Site of a Total Hip or Knee Arthroplasty,” JBJS, Vol.80-A, No. 6, June 1998, pp. 910-922.